The perfect entry point into the epic Tiger 1200 line-up comes with this capable new Tiger XR. An irresistible blend of all-day-riding comfort combined with technology-packed features, the new XR is almost four and a half pounds lighter than its predecessor and boasts the upgraded more responsive Triple engine, enhanced ergonomics new premium styling and ride-enhancing features including three riding modes, cruise control, switchable ABS and traction control, plus brand new cast wheels and lighter silencer. High specification Brembo brakes, WP adjustable suspension, adjustable seat height and electronically adjustable screen and a center stand all add to this amazing motorcycle's versatility. LIGHTER BY 4.4 LBS: The XR is an impressive 4.4 pounds lighter than its predecessor, enhancing its handling and maneuverability, and achieved through changes across the whole motorcycle including a lighter flywheel, crankshaft, exhaust silencer and battery. MORE POWERFUL AND RESPONSIVE ENGINE: The base specification Tiger 1200 XR engine delivers more peak power (139 HP at 9,350rpm) and maximum torque of 90 FT-lbs (at 7,600rpm), for more immediate delivery and even better all day, smooth reliable riding. 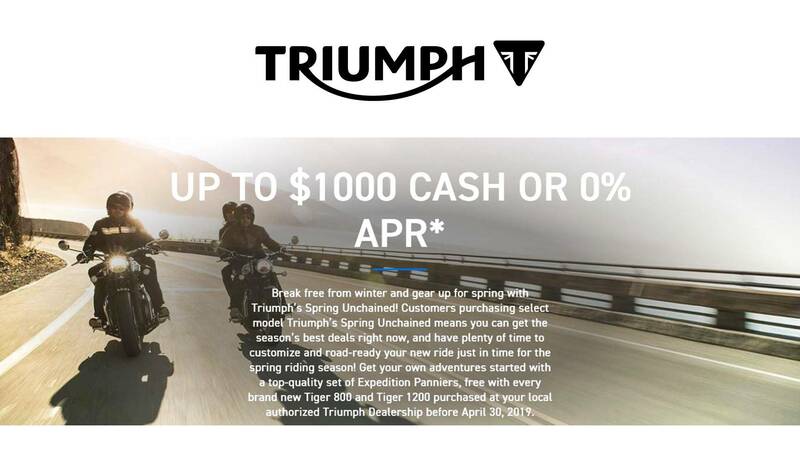 TECHNOLOGY: The XR comes equipped with the latest generation of Triumph's ride-by-wire throttle, switchable ABS and switchable traction control, cruise control, and handy USB and 12v power sockets. RIDING MODES: The base XR features three riding modes, with 'Rain', 'Road' and ‘Off-Road’ to suit the riding conditions and enhance the rider's control. NEW WHEELS AND HIGH QUALITY TIRES: Significantly enhanced specifications for better all-round capability, the XR model has new stylish black aluminum cast wheels fitted with Metzeler Tourance tubeless tires (front R19 x 3", rear R17 x 4.5"). ADJUSTABLE SEAT HEIGHT: The Tiger 1200 XR features an adjustable ‘2 position’ seat mechanism allowing the rider to lower seat height by .78 inches from 33.6 inches to 32.8 inches to suit their style and provide a more comfortable riding experience. BRAKES: Twin 305mm floating discs and radially mounted 4-piston monobloc Brembo calipers with new BRM10B brake pads on the front, and a single 282mm disc with Nissin 2-piston sliding caliper on the back. SUSPENSION: High quality manually adjustable suspension; WP 48mm upside-down forks can be set for rebound and compression damping, and rear suspension WP monoshock RSU is adjustable for preload and rebound damping. 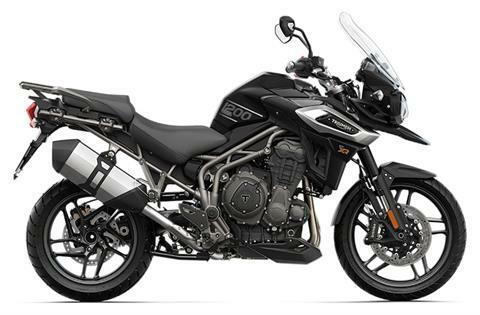 PREMIUM SPECIFICATION EQUIPMENT: There is an incredible level of standard equipment including integrated braking system, torque assist clutch and electronically adjustable screen, all enabling the Tiger 1200’s supreme capability.